Hey Kids! Andy Larson back for another exciting round of me doing all the work of reading something and you doing all the work of listening to me tell you about it. I have often said that sometimes the most interesting part of my read pile is how I come to the decision of which book I should cover next. You see, today’s blog post was supposed to be on Greg Rucka’s Queen & Country series, as I had it all loaded on my E-Reader for a recent weekend trip back to my family’s farm where I grew up. Only problem was as I was settling into that well worn easy chair in my old living room, hot cup of apple cider in my hands that I realized I had forgot the E-Reader on my desk before we left. So there I was, a read pile due for this week and no comic book to review. Needless to say, instead of panicking, I thought to myself: “There must have been some comics I left here somewhere…maybe in the attic”. So I took another sip of that apple cider to warm my bones a bit and headed up to the chilly lofts to see what I could find. And that’s when I saw it, buried under a couple issues of Marvel’s Star Wars series and some Avengers West Coast books I must have abandoned, one of the first ever graphic novels I ever got as a kid: Revenge of The Living Monolith! With a hefty price tag of $6.95 back in 1986 when I first got it, I believe I blew through most of allowance money for the month on this book. If I remember correctly, I might have been fueled on in buying it by my cousin, JA Scott, who was also buying some comics at the time and as a result, I picked this up just so I looked like a hip and happening 7 year old. I also remember that the main reason I got this one was because Spider-man was in it, as well as Captain America, and that scratched an itch of mine based on my love of the Secret Wars line of figures that was out at the same time. Plus, they were fighting a giant 50 foot monster guy, so that was an easy antagonist for my 7 year old mind to wrap its head around. In fact, I believe after reading this book I instantly took out some of my aforementioned Secret Wars figures, set up some cardboard boxes and started stomping around saying “I Am THE LIVING MONOLITH! NO POWER CAN SAVE YOU!”. That is until Black Suit Spidey came swinging to the rescue carrying Scarlet from GI Joe in his arms…(Scarlet often times played the part of my Angelica Jones aka Firestar aka my Mary Jane Watson fill in during toy playing sessions). Yeah the 80s had quite a lot good looking red heads…MJ…Teela…Firestar…Scarlet…but I digress. As I stood there in the attic wondering how I could have forgot to take this book with me when I moved out given it was probably the first ever graphic novel I owned, it then dawned on me. As a teenager, I regifted this book to my younger brother, Ethan, in one of my vain attempts to get him into comic books as my older brother had did to me. I mean, I had liked it as a kid, so I must have thought it would have been well received by Ethan as well. I guess the long and short of it was, it did not, so it must have sat in his meager collection of books he had in his closet for the longest time, and I had just forgotten about it. Eventually when my parents moved some of that junk to the attic, this must have come along for the ride. In any case, I thought given how I somewhat enjoyed this book as a kid, I thought it was a perfect book to review as an adult. This is especially true given there were large swaths of this book up until the actual fighting started that I pretty much ignored as a 7 year old that now I could read and provide real commentary on. 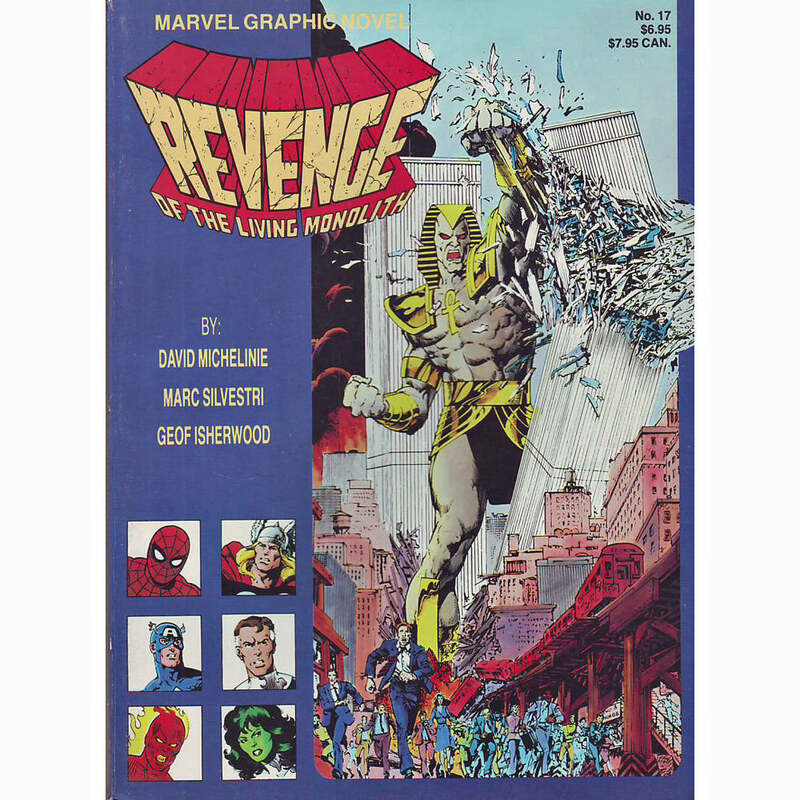 Revenge was written by David Michelinie who many comic fans know as the writer of some of the most well known Iron Man stories prior to RDJR’s arrival such as “Demon in a Bottle” and “Armor Wars” as well as long time plotter of the Amazing Spider-man book from 1987 through 1994, working with the likes of Todd McFarlane, Erik Larsen, and Mark Bagley. The art was done by Marc Silvestri, who is also well known from his time at Marvel working on the X-men book during the “Outback” adventures years as well as Wolverine. It was the 17th graphic novel released by Marvel specifically for the comic shop trade, a line that included such well known titles as “The Death of Captain Marvel”, “God Loves, Man Kills“, “The New Mutants” and “Emperor Doom” . 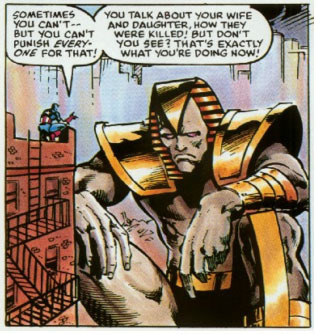 The book sheds some light on the backstory of a somewhat lesser known X-men villain named “The Living Pharaoh” who first appeared in some of the excellent issues done in the late 60s by Roy Thomas and Neil Adams. Reading like part team up story, part anti bullying PSA, the tale relates what drove the mutant, Ahmet Abdol, to become the power mad leader of a secret cult of Egyptian worshippers who view him as the next in the line of Pharaohs that should rule the world. From being picked on as a child to the death of his long time companion and later wife, the story depicts Ahmet as a someone who was deeply disenfranchised with his fellow men as a result of the pain and misfortune of his life, and in turn decides to lash out with fits of rage and anger. The only problem is his deadly ability to absorb cosmic rays can turn him into a gigantic gray engine of Tutankhamen terror, especially after he hatches a plan to increase his power exponentially by using the Fantastic Four as living cosmic batteries. Well, I should say “Fantastic Three” as this was during the time Post Secret Wars when the Thing was not part of the group, and instead the powerhouse duties were done by She-Hulk. After succeeding in turning Marvel’s First Family into a sack of Energizer D cells, Abdol transforms into his monstrous alter ego, and starts to way lay on the buildings of New York’s Upper East Side. Again, the driving force of this murderous rampage is supposed to be the death of his family at the hands by the unseen unnamed masses of humanity, but in the end, it seems a little weak in terms of a premise, so I’m just going to chalk it up to Michelinie wanting to tell a King Kong story and Living Monolith gave him an opportunity to do it. Of course, given this is a graphic novel and you gotta give the fans a little more bang for your buck, the destruction of New York brings out some of Marvel’s heavy flagship hitters with Captain America and Spider-man, although neither are equipped physically to go toe to toe with the behemoth. In fact, Spider-man actually plays the part of the brains of this operation, reversing the teleporter that kidnapped the FF to find Abdol’s secret base, and put his little cosmic energy feeder system out of commission. Meanwhile, Cap does what Cap does best in being the greatest diplomat on the face of the planet, as he manages to reason with the Living Monolith at least for a little while reminding him that engaging in such wanton destruction, he is no better than all the bullies that use to pick on him, killing other people’s families, and propagating the cycle of revenge and violence. It’s actually some of the best dialogue in the entire book, and especially in today’s world, still rings true, with its message not to let a couple of bad apples destroy your faith and hope in the common decency of humanity on the whole. And coming from the Star Spangled Avenger’s lips it has all the gravitas and sincerity that you could possibly muster. No wonder even Abdol sits down and begins to see the error of his ways. I mean you really can’t argue with Cap. He’s got the might of right on his side. In the end, the book closes by the Living Monolith seeing how wrong his lifetime quest for vengeance was. But the problem is, he’ll never stop growing due to the acceleration of his powers from the cosmic energies of the Fantastic Four. So he asks the Avengers to send him into space where he can do no further harm, a request with which they happily comply. From there he takes a page out of Ego, the Living Planet’s playbook, becoming overtime, his own orbiting ecosystem. As a side note on the ending, it’s Thor’s hammer which sends the gargantuan out among the stars, in the 3 panels of an appearance which warranted a cover appearance? I mean seriously, that’s one of my only knocks on the book. Thor gets a cover appearance for 3 panels worth of work??? Y’know Iron Man carried the ropes that Thor used to tie up the Monolith, and the original 5 X-men were seen in flashback fighting Abdol earlier, yet Thor gets the cover appearance? C’mon they all did just about as much work as Thor did in this thing. If I was a Thor fan and bought this book to see Thor, I would have demanded my money back. Outrageous! But in closing, this wasn’t a bad book. It wasn’t great either though. It’s pretty much your standard middle ground comic book melodrama. I’m not sure if it warranted being in the same league as some of those other graphic novels from this series that I mentioned earlier, those truly historic and iconic stories that are frequently called back to in all kinds of Marvel Comics media. I’m sort of glad I picked it up as a child and it gave me some solid story foundations for the adventures with my Marvel figures, as I’m not sure there’s much more here. It seems like at times it wants to be more, that it strives to be more, but in the end it’s no different than any other 2 to 3 issue story that you might see in the Avengers or the Fantastic Four during this time period. Or…Marvel Team-Up. Oh, yeah, the second half of this book is definitely just a Marvel Team Up story.